(1996) "Because You Loved Me"
(1996) "J'irai où tu iras"
"Because You Loved Me" is a song recorded by Canadian singer Celine Dion for her fourth English-language studio album, Falling into You (1996). It was released on 20 February 1996, as the first single in North America, South America and Asia. It was released as the second single from the album in Australia, on 29 April 1996, and in May 1996 in Europe. "Because You Loved Me" was written by Diane Warren and produced by David Foster, and served as the theme song from the 1996 film Up Close & Personal, starring Robert Redford and Michelle Pfeiffer. "Because You Loved Me" received critical acclaim and became a worldwide hit, reaching number one in the United States, Canada and Australia, and reaching top ten in many other countries. In the United States alone, it has sold over two million copies. "Because You Loved Me" won the Grammy Award for Best Song Written Specifically for a Motion Picture or Television, and was nominated for the Grammy Award for Record of the Year, Song of the Year and Best Female Pop Vocal Performance. It was also nominated for the Academy Award for Best Original Song and Golden Globe Award for Best Original Song. "Because You Loved Me" was written by Diane Warren and produced by David Foster. Both Warren and Foster worked with Dion on her previous English-language albums. The song is a downtempo pop ballad, and its lyrics revolve around the protagonist thanking a loyal loved one for guiding, encouraging, and protecting her throughout her life, and making her who she is today. Warren said that the song was a tribute to her father. "Because You Loved Me" served as the theme song from the 1996 film Up Close & Personal, starring Robert Redford and Michelle Pfeiffer. However, the song was not included on the film's soundtrack. "Because You Loved Me" was released as the first single from Falling into You in North America, South America and Asia in February 1996. It was issued as the second single in Australia (April 1996) and Europe (May 1996), after "Falling into You." The song is written in the key of D♭ major with a slow tempo of 60 beats per minute. Dion's vocals span from A♭3 to E♭5 in the song. The final chorus is set in E♭ major. "Because You Loved Me" received positive reviews from music critics. Larry Flick from Billboard wrote that "Because You Loved Me" is "rife with grand romance, larger-than-life production, and a climax that is best described as the musical equivalent to 4th of July fireworks." Another Billboard editor, Paul Verna also highlighted the chart-topping "Because You Loved Me." Stephen Holden of The New York Times praised it calling it this year's "Wind Beneath My Wings." Positive review also came from senior editor of AllMusic, Stephen Thomas Erlewine who praised ballads like "Because You Loved Me" on Falling into You. 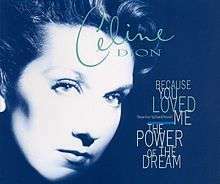 In the United States, "Because You Loved Me" became Dion's second number one single, after "The Power of Love" in 1994. It topped the Billboard Hot 100 chart for six consecutive weeks and ended the reign at the top of "One Sweet Day" by Mariah Carey and Boyz II Men. "Because You Loved Me" also topped the Adult Contemporary Singles for nineteen weeks and set a record for most weeks at number one on this chart. In the following years, only five songs spent more time at the top, including Dion's own "A New Day Has Come" in 2002 (twenty-one weeks). "Because You Loved Me" also reached number one on other US charts, including Hot 100 Airplay for fourteen weeks, Adult Top 40 for twelve weeks, Hot Singles Sales for six weeks and Mainstream Top 40 for five weeks. In April 1996, it was certified Platinum by the RIAA for selling one million copies in the US. As of April 2012, "Because You Loved Me" has sold 1,343,000 physical copies and 704,000 digital units, for a total of 2,047,000 copies. According to Billboard, "Because You Loved Me" is Dion's biggest Billboard Hot 100 hit, followed by "It's All Coming Back to Me Now," also from Falling into You. In Canada, "Because You Loved Me" topped the The Record Singles Chart for one week in May 1996 and also spent ten weeks at number one on the RPM Adult Contemporary Chart. It became the number-one song on the RPM Adult Contemporary 1996 Year-end Chart. "Because You Loved Me" also topped the chart in Australia for three weeks and reached number two in Ireland, number three in New Zealand and Switzerland, number four in the Netherlands, number five in the United Kingdom and Belgium Flanders, and number eight in Denmark. It was certified 2× Platinum in Australia, Platinum in New Zealand, Gold in the United Kingdom and Germany, and is eligible for Silver in France. As one of Dion's biggest hits, "Because You Loved Me" was included on her both greatest hits compilations: All the Way... A Decade of Song (1999) and My Love: Essential Collection (2008). At the 39th Annual Grammy Awards, "Because You Loved Me" was nominated for the Grammy Award for Record of the Year, Best Female Pop Vocal Performance, Song of the Year and won the Grammy Award for Best Song Written Specifically for a Motion Picture or Television. At the Juno Awards of 1997, "Because You Loved Me" was nominated for the Juno Award for Single of the Year. It was also nominated for four Billboard Music Awards in 1996 in categories: Hot 100 Singles, Hot 100 Singles Airplay, Hot Adult Contemporary Singles & Tracks and Hot Adult Top 40 Singles & Tracks. Additionally, "Because You Loved Me" was nominated for the Academy Award for Best Original Song, Golden Globe Award for Best Original Song and Blockbuster Entertainment Award for Favourite Song from a Movie. It also won the ASCAP Film and Television Music Award for Most Performed Song from Motion Picture and the ASCAP Pop Awards for Most Performed Song in 1997, 1998 and 1999. A music video was created for the song and showed Dion singing interspersed with clips from the film Up Close & Personal. It was directed by Kevin Bray in January 1996 and released in March 1996. During the promotion of Falling into You, Dion performed "Because You Loved Me" on various television shows in the United States, Italy, Germany and the Netherlands. She also performed it at the Blockbuster Entertainment Awards and World Music Awards in 1996, and most notably at the 69th Academy Awards in March 1997. "Because You Loved Me" became a part of the Falling Into You Around the World Tour, Let's Talk About Love World Tour and Taking Chances World Tour. It was also performed during Dion's two Las Vegas shows, A New Day... and Celine. The live performances of "Because You Loved Me" were included on Live in Memphis (1998), All the Way... A Decade of Song & Video (2001), A New Day... Live in Las Vegas (2004), Live in Las Vegas: A New Day... (2007) and Taking Chances World Tour: The Concert (2010). In 2016, Dion performed "Because You Loved Me" during her Summer Tour 2016. In 1997, Dominican singer Milly Quezada released a Spanish version of the song titled "Porque Me Amaste" on her album Hasta Siempre. This version peaked at number twenty-nine on the Billboard Hot Latin Songs chart and number four on the Billboard Tropical Songs. The track was also covered by Johnny Mathis (1998), Michael Ball (1998), Vivian Reed (2001), Jane McDonald (2001), Siti Nurhaliza (2005), Clay Aiken (2006), Miho Fukuhara (2007), Nina Girado (2008) and Diamond White (2012). The song was covered by Glee in the episode "Props" by Jenna Ushkowitz as Tina Cohen-Chang and Lea Michele as Rachel Berry and also in the CBS daytime series The Bold and the Beautiful by Bobbie Eakes as Macy Alexander in the Episode number 1.2765 originally broadcast on 1 April 1998. Eakes version was released on the various artists soundtrack album Love Affair in 2008 which feature several stars from ABC Daytime's hottest shows. It was also covered by artist Michael Terry. Another popular cover was recorded by singer Ana Laura for her self-titled debut album. Filipina singer, Jolina Magdangal recorded a cover for her 2014 album. ↑ Diane, Warren,. "Because You Loved Me". www.musicnotes.com. Retrieved 26 January 2016. ↑ Larry Flick (24 February 1996). "Reviews & Previews". Billboard. Prometheus Global Media. Retrieved 29 November 2014. ↑ Paul Verna (30 March 1996). "Reviews & Previews". Billboard. Prometheus Global Media. Retrieved 29 November 2014. ↑ Stephen Holden (14 April 1996). "New Releases". The New York Times. The New York Times Company. Retrieved 9 March 2012. ↑ Stephen Thomas Erlewine. "Falling into You - Celine Dion Songs, Reviews, Credits, Awards". AllMusic. Retrieved 9 March 2012. ↑ "Céline Dion - Because You Loved Me (Song)". Hung Medien. Retrieved 26 September 2014. ↑ "Céline Dion - Because You Loved Me (Song)" (in German). Hung Medien. Retrieved 26 September 2014. ↑ "Céline Dion - Because You Loved Me" (in Dutch). Ultratop & Hung Medien. Retrieved 26 September 2014. ↑ "Céline Dion - Because You Loved Me" (in French). Ultratop & Hung Medien. Retrieved 26 September 2014. 1 2 Nanda Lwin (1999). Top 40 Hits: The Essential Chart Guide. Music Data Canada. ISBN 1-896594-13-1. ↑ "Top RPM Singles: Issue 2950." RPM. Library and Archives Canada. Retrieved 3 September 2014. ↑ "Top RPM Adult Contemporary: Issue 2927." RPM. Library and Archives Canada. Retrieved 3 September 2014. ↑ "Hits of the World". Billboard. Prometheus Global Media. 20 July 1996. Retrieved 27 September 2014. ↑ "Céline Dion - Because You Loved Me (chanson)" (in French). Hung Medien. Retrieved 26 September 2014. ↑ "Offiziellecharts.de – Céline Dion – Because You Loved Me". GfK Entertainment Charts. Retrieved 4 September 2016. ↑ "The Irish Charts – Search Results – Because You Loved Me". Irish Singles Chart. Retrieved 4 September 2014. ↑ "Nederlandse Top 40 – week 23, 1996" (in Dutch). Dutch Top 40 Retrieved 4 September 2014. ↑ "Single Top 100". Hung Medien. Retrieved 26 September 2014. ↑ "Archive Chart: 1996-06-16". Scottish Singles Top 40. Retrieved 19 May 2015. ↑ Fernando Salaverri (September 2005). Sólo éxitos: año a año, 1959–2002 (1st ed.). Spain: Fundación Autor-SGAE. ISBN 84-8048-639-2. ↑ "Céline Dion - Because You Loved Me". Hung Medien. Retrieved 26 September 2014. ↑ "Celine Dion: Artist Chart History" Official Charts Company. Retrieved 4 September 2014. ↑ "Celine Dion – Chart history" Billboard Hot 100 for Celine Dion. Retrieved 27 September 2014. ↑ "Celine Dion – Chart history" Billboard Adult Contemporary for Celine Dion. Retrieved 27 September 2014. ↑ "Celine Dion – Chart history" Billboard Adult Pop Songs for Celine Dion. Retrieved 27 September 2014. ↑ "Celine Dion – Chart history" Billboard Hot R&B/Hip-Hop Songs for Celine Dion. Retrieved 27 September 2014. ↑ "Celine Dion – Chart history" Billboard Pop Songs for Celine Dion. Retrieved 27 September 2014. ↑ "Celine Dion – Chart history" Billboard Rhythmic Songs for Celine Dion. Retrieved 27 September 2014. ↑ "ARIA Charts - End Of Year Charts - Top 50 Singles 1996". ARIA. Retrieved 28 September 2014. ↑ "Jaaroverzichten 1996" (in Dutch). Ultratop. Retrieved 28 September 2014. ↑ "Rapports annuels 1996" (in French). Ultratop. Retrieved 28 September 2014. ↑ "RPM Year End Top 100 Hit Tracks". RPM. 16 December 1996. Retrieved 28 September 2014. ↑ "RPM Year End Top 100 Adult Contemporary Tracks". RPM. 16 December 1996. Retrieved 28 September 2014. ↑ "Classement Singles - année 1996" (in French). SNEP. Archived from the original on 15 September 2012. Retrieved 28 September 2014. ↑ "Top 100 Single-Jahrescharts" (in German). GfK Entertainment. Retrieved 5 June 2015. ↑ "Single Top 100 Van 1996" (PDF) (in Dutch). Stichting Nederlandse Top 40. Retrieved 29 September 2014. ↑ "Jaaroverzichten - single 1996". Hung Medien. Retrieved 8 October 2014. ↑ "Top Selling Singles of 1996". RIANZ. Retrieved 7 May 2015. ↑ "Årslista Singlar - År 1996" (in Swedish). GLF. Archived from the original on 27 September 2015. Retrieved 28 September 2014. ↑ "Swiss Year-end Charts 1996". Hung Medien. Retrieved 28 September 2014. ↑ "Najlepsze single na UK Top 40-1996 wg sprzedaży" (in Polish). Official Charts Company. Archived from the original on 4 June 2015. Retrieved 22 September 2014. 1 2 3 4 "The Year in Music: 1996" (PDF). Billboard. Prometheus Global Media. 28 December 1996. Retrieved 16 May 2015. ↑ "Hot 100 Singles of the '90s". Billboard. Prometheus Global Media. 25 December 1999. Retrieved 28 September 2014. ↑ "Best of All Time - Singles". Hung Medien. Retrieved 29 September 2014. ↑ "Gold-/Platin-Datenbank (Celine Dion; 'Because You Loved Me')" (in German). Bundesverband Musikindustrie. ↑ Dean Scapolo (2007). The Complete New Zealand Music Charts 1966-2006. RIANZ. ISBN 978-1-877443-00-8. ↑ Lane, Dan (14 November 2013). "Celine Dion's Official Top 40 Biggest Selling Singles revealed". Official Charts Company. Retrieved 28 September 2014. ↑ "Ask Billboard: Does Lionel Richie Make Billboard Chart History?". Billboard. Prometheus Global Media. 8 April 2012. Retrieved 28 September 2014. ↑ "Hasta Siempre - Milly Quezada: Awards". Allmusic. Rovi. ↑ "Diamond White: Because We Love You - THE X FACTOR USA 2012". Performance. anonymous. ↑ "ABC Daytime Love Affair - Various Artists: Overview". Allmusic. Rovi.